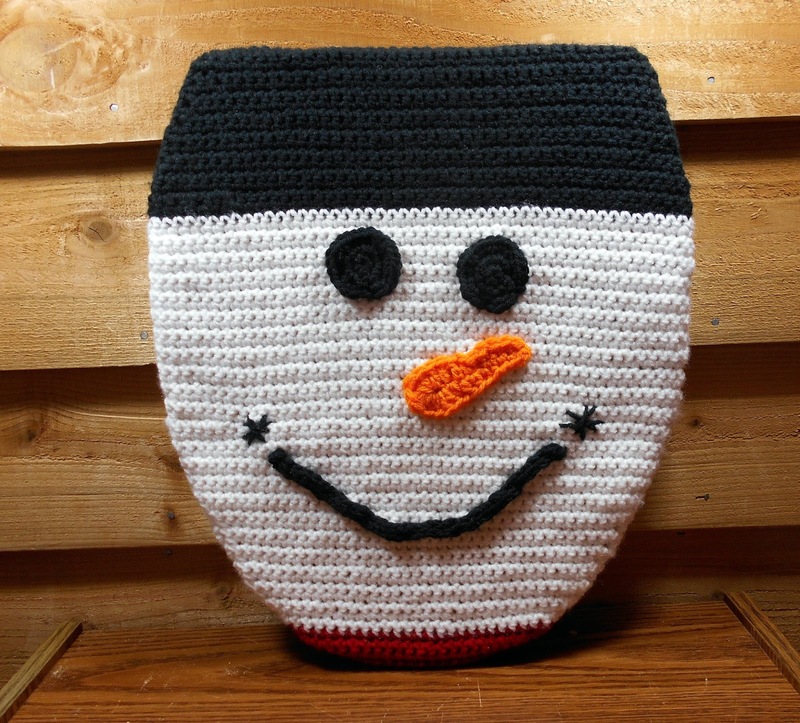 He's a crocheted toilet seat lid cover. I used worsted weight scraps of yarn to make him. But first, I put a piece of cardboard under the toilet seat and traced around it. Then I cut along the cardboard line to get a mighty fine template to use so I'd be sure to make it the right size the first time. Started with black yarn, and a size H hook. I used sc and worked 15 rows, increasing as I went to make it the same size as the cardboard template. Then I switched to white yarn, increasing as needed. Finally, I had to start decreasing. Towards the end I switched to red yarn so it would look like he was wearing a scarf around his neck. When you come to the end of the cardboard template, fasten off. Then begin working around the sides. The first 6 rows around the sides I matched the color of yarns. On row 7, I switched over to black and for that row only I worked sc in the back loop only (blo). Then I worked one row of hdc and one row of sc. Fasten off. Sew a casing for the elastic using the free loop and the loops on the last row. Then work 3 rows of sc in black on the section that will be at the hinge of the toilet seat. Work one row in the back loop only (blo), followed by one hdc row and one sc row. Fasten off and make a casing for the elastic. I used elastic cord. Pull it tight so it fits the toilet seat, but no so tight you have to fight to get it off and on. Tie a knot, dab some glue on the knot and cut the cord as close to the knot as you feel comfortable with. For the eyes, I used black yarn and made a circle with dc. I increased 6 stitches on the 2nd and 3rd round and I was done. For the nose, I used orange yarn. I made a chain the length I wanted the nose to be plus 2 more. Sc in the 2nd chain from the hook, Sc in the next 2 sts, hdc in the next 3 sts, dc in the next 2 sts. 6 dc in the last ch, turn and repeat on the other side of the chain. Fasten off. Use the tails to sew the nose (and yes, the eyes) to the face. I knitted an I-cord for the mouth. Mine is 12 inches long. I had a long tail on both ends that I used to make the stars and to sew the I-cord onto the face. And that's it. I had no pattern when I started and I still don't. I just had an idea and was willing to try something new and different.